Hi, everyone! My brother is quite the handy man. When we were growing up he was always at my dad's side, helping him when there was repairing or building to be done. He learned to do things at a young age which later proved beneficial in adulthood. Today he has built things for his family or repaired things that needed to be repaired. I just wish he lived near by so I could hire him for things that I need done around my home. But alas, he and his family reside in Georgia. So....I decided to make this card for him for his upcoming birthday. In my garage I have a pegboard with garden tools on it. 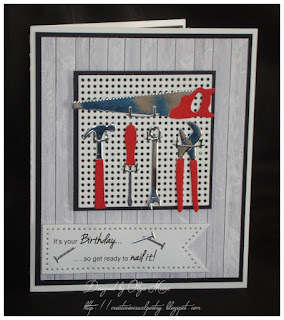 I wanted to design a card with a realistic looking pegboard filled with workshop tools. The above card is what I came up with. All the dies used in this project, with the exception of the banner with the sentiment, are from Our Daily Bread Designs. I began with creating the pegboard in GKD Pure Luxury White card stock and matted it with GKD Black Onyx card stock. Next, I die cut the tools in silver mirror paper and then paper pieced the tool handles with GKD Cherry Red card stock. The tools were then attached to the peg board and die cut hooks were added to give it a realistic look. The sentiment was composed and then computer generated and die cut with a die from Avery Elle Dotted Elle-Ments die set. Die cut nails were added as a final touch. After my themed focal panel was completed, the base card was created using GKD Pure Luxury White card stock. This was layered with GKD Black onyx card stock. The background layer for the focal point was wood panel digital paper from my stash. The final step was to adhere the pegboard and sentiment banner and the job was done. I hope you liked this card and enjoyed this post. Thanks for visiting and please come back often. In the meantime, make it a great day! 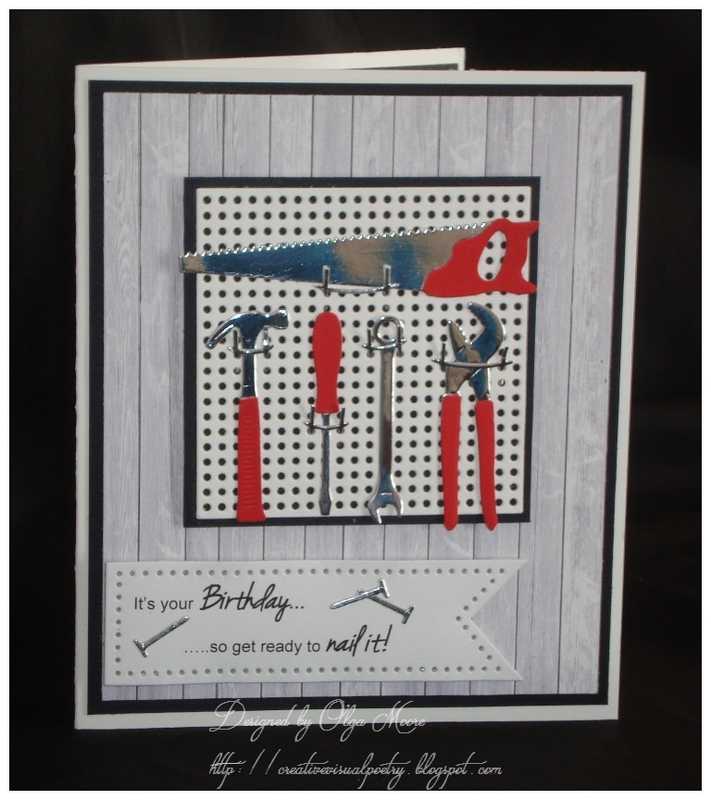 That is a great card for a handyman. Loved those tools. How very clever, I love that you have attached those tools to a peg board. I'm pinning this one - such inspiration here. Your brother will LOVE it!! !